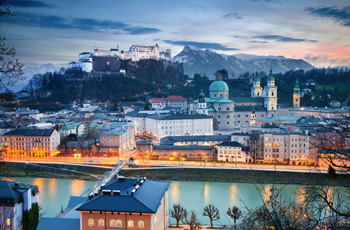 Salzburg is a city of age-old sophistication, cafés and world-class music, the birthplace of Mozart. The surrounding region offers majestic Alps, sparkling lakes, and rustic villages. Take in a concert or visit a stately cathedral or castle. Hike into the mountains and explore nearby caves and waterfalls. Stay in a vacation apartment in a charming village near beautiful Salzburg. Ride the trains, or substitute a rental car. Day trip options: Grossglockner (the highest peak in the Austrian Alps), Zell am See, Schloss Hellbrun, Graz, Innsbruck, or a longer trip to Vienna. Day trips and Sightseeing: Sample all the delights of Salzburg: The gardens at the Mirabell Palace, window shopping at the fashionable shops and strolling among the ornate ironwork signs of Getreidegasse. Take in Mozart’s birthplace, not to mention Salzburg’s world-famous castle, cathedral and concerts. Outside this fascinating city, visit Grossglockner, the highest peak in the Austrian Alps; try your hand at windsurfing at Zell am See; or play the water games at Schloss Hellbrun. Longer day trips are possible to Graz and Innsbruck, or you can combine a visit to the delightful Wachau region of the Danube with an overnight in Vienna. For off-the-beaten-track activities that can’t be beat: "Summer sliding" down the Alps, daily falconry demonstrations at the local Hohenwerfen castle, sampling spicy sausages as you stroll through the open-air markets in Salzburg’s University Square, taking a miniature train to see the salt mines deep below the earth at Hallein, exploring the world’s largest ice cave right in the Untour home village of Werfen, or just strolling through meadows of wildflowers outside your hometown to see the Golling waterfall. One or two weeks in a personally selected, private apartment in the Salzburg area. Transfer assistance from the Salzburg airport to your Untours apartment and back. A 2nd class 5 or 10-day rail pass, good throughout Austria, plus local transportation tickets. Travel to Salzburg is free with the local guest card. Call the office if you are interested in substituting a rental car. Local information, plus our own Untouring Austria guidebook, researched and written by Untours staff, full of the best restaurants, sightseeing, and other suggestions. An Untours sponsored event, like a sumptuous Austrian meal with our local staff person, or a guided trip to an Alpine lake.